9) Midnight cafe – for the vegetarians! Probably one of the best local burger spots in Dubai. That’s a glorious Edam burger. Don’t let that odd name throw you off. 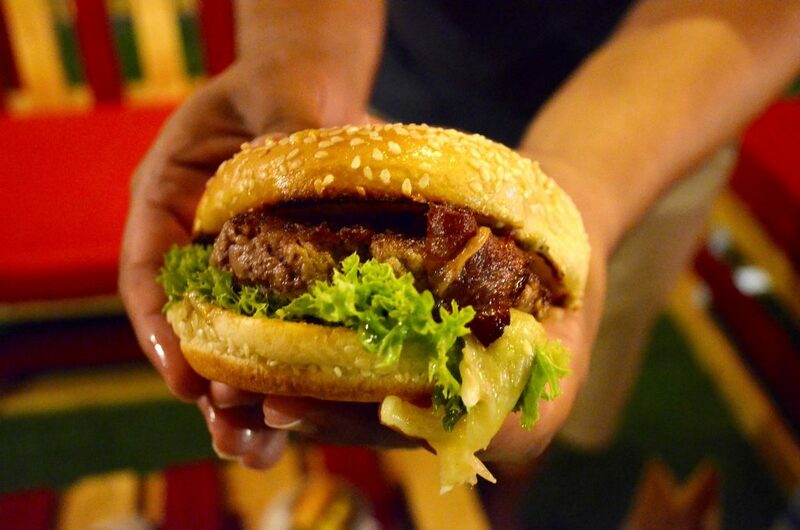 25″55′ is a secret local burger favourite in Dubai in the Mirdiff area. It also houses an original branch in Hatta! Besides a chicken doritos burger, they have a mean Dam burger, which is a beef burger stuffed with Edam cheese. Don’t miss this one! They have a lotus shake that’s apparently quite good and decent flame cheez fries. Rumour is that they’re soon opening another branch in the Jumeirah area. Salt is what I’d call a pioneer in the Dubai local food truck scene. Now it holds pride of place in the Kite Beach, Jumeirah area, but now has more than one branch (I spotted one in Ajman recently. They also have one near Marina mall). Though these burgers are small in size, they’re not small in flavour. AT.ALL. Their Cheetos burger is a revelation. Their Lotus softie? Legendary. I’d like to call this place a disruptor in the F&B scene. Started by the same ladies at Salt, this place in Dubai Mall has taken the city by storm! Why? You can’t enter it unless you have a key. They have key hunts all over Dubai. Follow them on Snapchat @byparkers to get access. They used to be a pop-up in Al Khazzan solar park, but moved to Dubai Mall last summer. Try their choco x coffee slider, which is confusing but delicious! Their classic Parker’s burger is delicious as well. Their Lotus drama dessert is by far the best I’ve had in Dubai. This place has the oh-so-famous truffle fries and burger as well. Another Jumeirah joint, Moylo’s has an amazing honey bee burger. Their truffle shuffle burger is delightful as well. They also happen to have a food truck and turn up at food truck festivals now; but I’ve always preferred their OG joint. Find them here. Besides the super catchy name, I really enjoy their Smokey Sheikh burger with BBQ sauce. It’s located in JLT. They also have a branch in Business Bay. Amazing mini burgers at affordable prices! 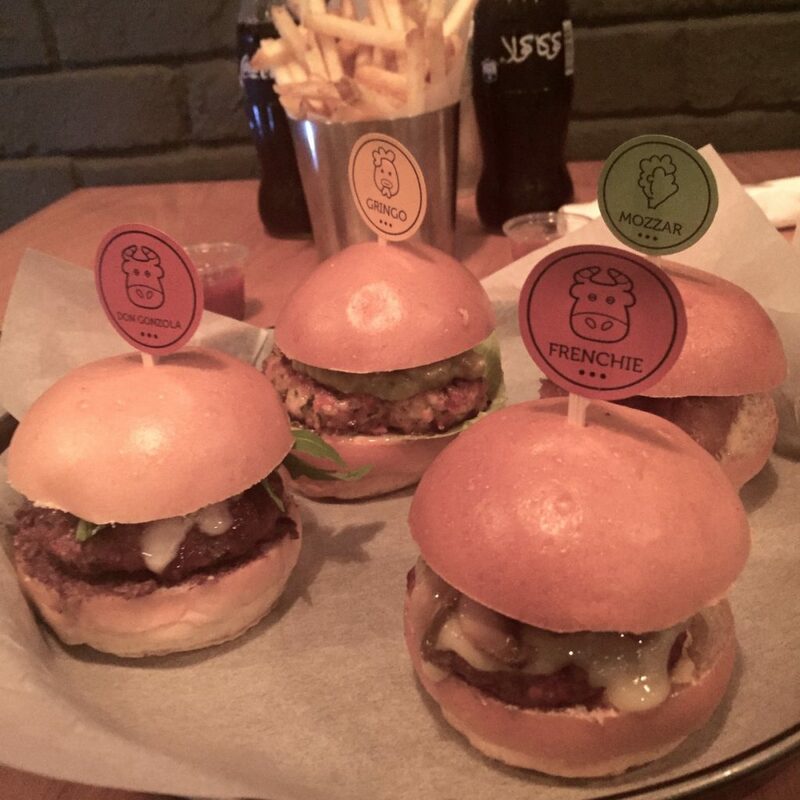 Another wonderful burger place in JLT, Smokin’ 9 has amazing mini burgers. F.C. loves the Don Gonzola, whereas I love the Frenchie! There’s a reason why JLT is one of my favourite places. Wolf & Friends Lounge make their ingredients fresh in house, even the sauces! Thanks JLT Dining for the tip! Still have to try this one. A recent addition and a relatively new opening, Nomad in Umm Suqeim has volcanic burgers and various ‘baos’ and burgers. Spotted it on Where my Food at‘s feed originally. Royal Zaafran burger anyone? How about an Extreme buffalo burger? Both are delicious! A local favourite, Midnight cafe in Karama apparently has a really good veggie burger! Who would’ve thought? This place in Media city has an epic BBQ ranch burger in a potato bun. Totally worth a visit. The owner is so passionate about feedback, so your suggestions will always be welcomed. Despite this place being literally across the street, I haven’t tried it yet. Started by a Filipino expat, the burgers went viral by Insider not too long ago and were really popular this year. This place is somewhat of a sensation. Previously, it had far more intrigue as people used to Whatsapp their orders 24 hours in advance for their burgers and the business ran directly through Instagram and out of a Mirdiff villa. Now, it’s available at Dar Al Wasl mall. She Burger is owned and operated by a female Emirati entrepreneur called Shaikha Eissa. 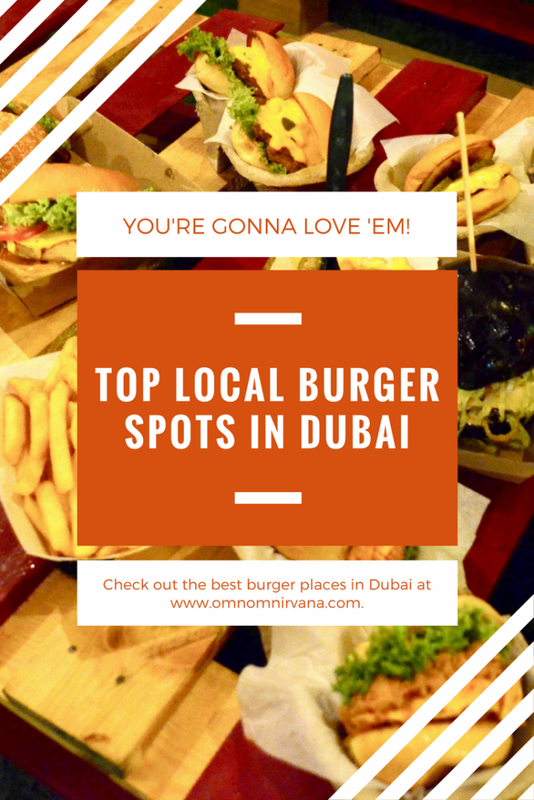 So there you have it, the best local burger spots in Dubai! I’m gonna constantly update this list with new places, so make sure you leave me a comment if I left some place out! Always remember to support local businesses rather than the regular fast food places, otherwise they tend to die out! Great round-up! Tried most of them, Nomad is on my list too! Dubai sure loves it burgers hey? I’m glad my favourite Moylos it on your list. I think Salt is bit overrated but Parkers is fab.